-start the game and choose the level under the appropriate game type. 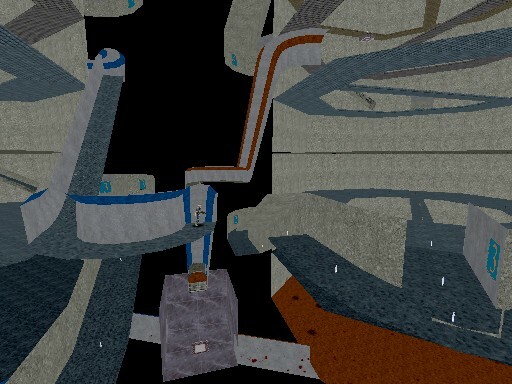 EvilTower is a fairly small map that is intended to provide considerable z-axis action. A tunnel wraps its way fully around the central tower. The tunnel has plenty of health vials. It gives access to each of the eight floors of the central tower, where all of the weapons, ammo, damage amp, jumpboots and shield belt can be found. Most of the weapons are on narrow walkways across the centre of the tower. There is also an attic that opens out on the roof of the tower. One very open elevator travels up the inside of the tower, from the ground floor all the way to the attic, stopping briefly at each level. The map is fully zoned. Each floor of the tower is labelled as Levels 1 to 8, together with the main weapon to be found on the walkway of that level. The tunnel is also fully zoned for each level. In a team game "F1" will reveal the locations of all teammates. 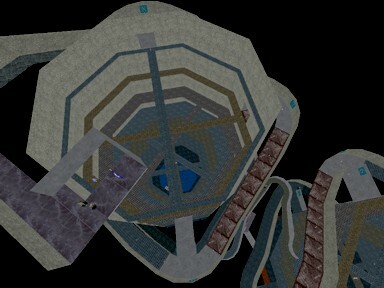 The Capture-The-Flag version of this map uses two such towers, one for red, the other for blue. The flags are at the top of each tower. The towers are connected by pathways at levels 1 and 5. I chose the splendid track from AS-Golgotha (thank you Grzegorz Kubicki) as the music track for this and several other creations. I created my own texture pack for the floor level icons, using only the simplest features of CorelDraw 10. All other sounds and textures should be standard. A bot will occasionally get stuck, running on the spot. However, most of them are able to find the control points in DOM and the flag in CTF. They do jump between levels in the central well and use the surrounding tunnels. I am not aware of any other problems. Created 2003 01 11 and last modified 2003 02 18 by Doctor Evil.